PewDiePie vs. T-Series war is still going on and the most faithful fans of the Swedish creator are doing everything to make him the king of YouTube. Some buy advertisements on billboards, others simply ask for a subscription for Felix, and others ... they encrypt hard drives. 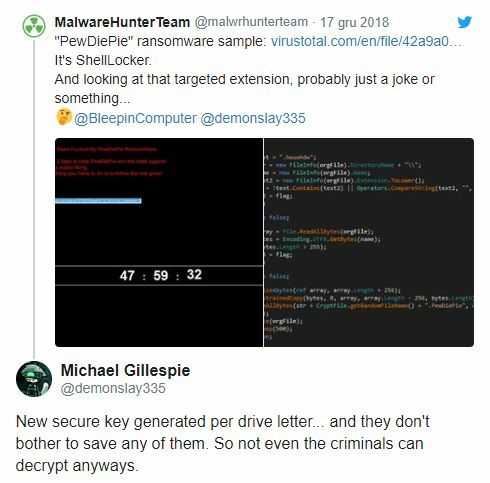 Some fans of Felix Kjellberg have gone to such a drastic pace as launching at least two ransomware variants that encrypt victims' hard drives. They display information that the decryption key will be made available when PewDiePie passes the limit of 100,000,000 subscriptions. One virus warned, however, that if at any time the T-Series channel hits the Swede in the number of subscriptions, the key will be deleted and the files will be lost forever. However, it was not true at all. The first version of the ransomware released in December was a badly modified ShellLocker modification. Not too familiar with ransomware coding, the creator created a program that did not save or send decryption keys anywhere - the same time once blocked files were lost forever. The second version appeared in January and was already a real virus named PewCrypt. Ransomware created in Java already had all the necessary functions - both encryption and the ability to unlock files. At the moment, YouTube Realtime shows that PewDiePie has around 90,738,000 sub. The T-Series is just 2 million behind it, which means that the risk of removing the keys could have been very large. As it turns out, the malware was just a joke. The virus has succeeded, however, to encrypt user data. The author realized the troubles he could get through. At that time, he also made the source code of the program available on GitHub, along with a command-line decryption tool.